Welcome to Byske Skomakeri! My name is Roger Viklund. 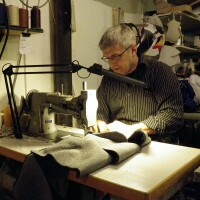 I am a shoe maker, saddler, and upholsterer. After completing the teacher academy I discovered how fun it is working with hide. The living feeling and soft properties of hide are fascinating. I started out sewing traditional pleated coffe bags. In 1985 I installed my first professional sewing machine. The same year I was able to start my business in localities of the former shoe maker Nilsson. During ten years I was working full-time and today Byske Skomakeri is a part-time business among others. These days I sew just about anything that can be produced with an industrial sewing machine. On this web site you may read about my craftsmanship and view most of my products such as hats and flyfishing gear. Check out The Byske Vest – a unique fly fishing vest! Please contact us and we will custimize the product for your needs. Hats are in stock most of the time and availability is greatest around the time of Jokkmokk’s market which we have attended for 30 years. During the market days we are located opposite the tourist information centre. 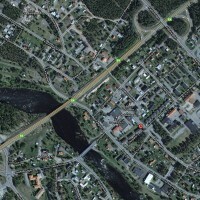 At the Gällivare market you may find us near the recreation centre. You may also order hats directly via Internet or by phone. Delivery time may vary depending on season, supplies, and demand. Please contact us before placing an order to get current prices and we will also answer any questions you may have. We accept advance payment as well as payment on delivery. In case of return the customer pays the return postage fee. In case of trading the customer pays the return fee and we pay the postage for sending you a different item.